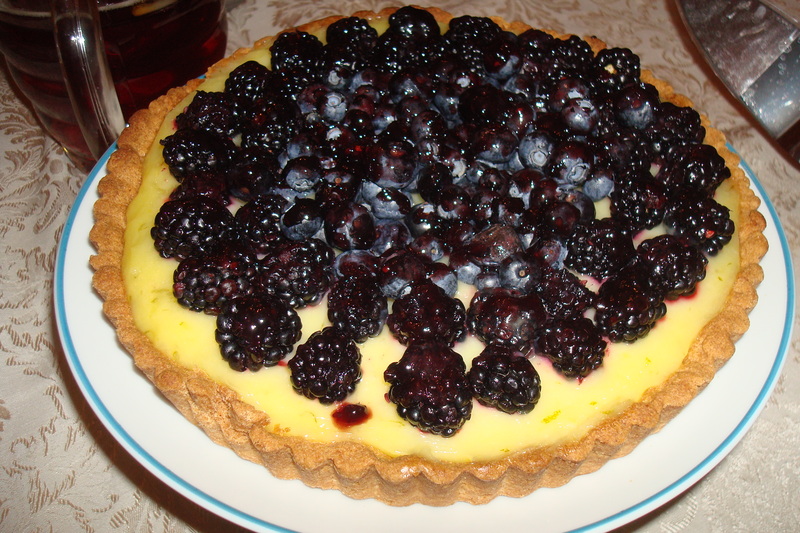 Bon Appetit's Lime Tart with Blackberries and Blueberries. 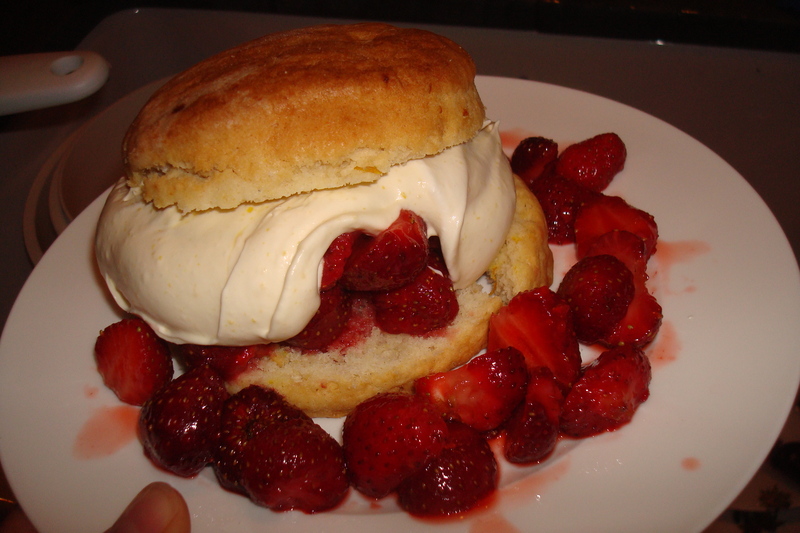 Ivy Manning's strawberry shortcake with lemon curd cream. Okay, okay, I finally posted something pretty and tasty for those of you made squeamish by my last blog post. Berries and tart citrus curds (tangy egg yolk puddings) should be less controversial. Well, not curd perhaps. For a shortcut with the above strawberry shortcake dessert, I might recommend buying some store-bought lemon curd. Instead, I stood over a hot stove (in last week’s heat wave, which even swept northernmost Maine) for 30 minutes, constantly whisking the thickening curd slowly heating in a bowl over a pot of boiling water. But stirring that zesty curd into freshly-whipped whipped cream made for a memorable, albeit rich, shortcake. The citrus in the cream and orange zest in the homemade biscuits (I would add chopped crystallized ginger next time, too) complimented the fragrant local Maine strawberries. 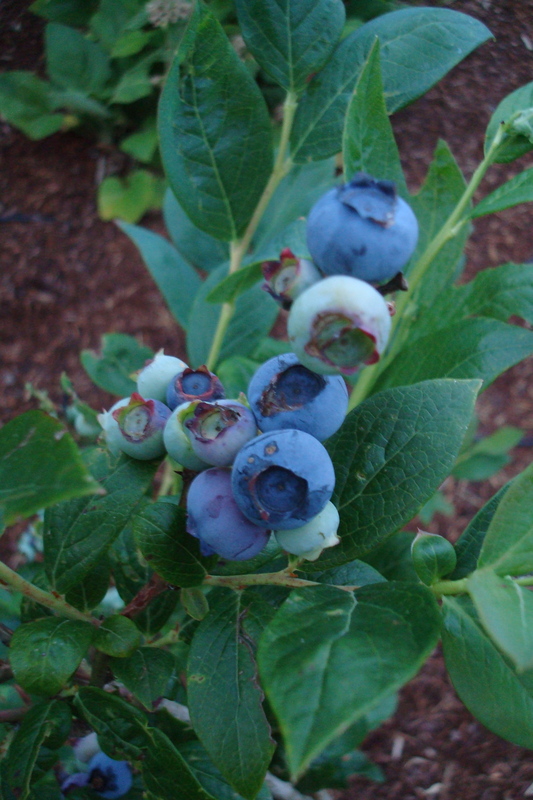 The berries are ripe at the Small Farmers' Project site in Eugene. It was sad to leave my blueberries, just now ripening on the cane. Then just two days later, curd turned up again in a berry dessert tonight at dear reader Judy’s house. She made a magnificent lime curd tart with blackberries and blueberries that looked just like the picture that ran with the recipe in Bon Appetit! With no whipped cream, this fruit tart was a considerably lighter dessert, the perfect conclusion to a barbecue on a warm summer night. Best of all, the latter curd takes less time to make, requiring a mere six minutes of whisking instead of 30. This one calls for gauging the curd temperature with an instant-read thermometer, but both curiously instruct you to press plastic wrap onto the surface of the curd while it cools? Does that just ensure it has a smoother texture? That’s one recommendation I ignored. Here’s a good step-by-step guide to making curd from Bon Appetit. I’ll have to ask Portland cookbook author Ivy Manning why the process she outlined in The Farm to Table Cookbook took so much longer. 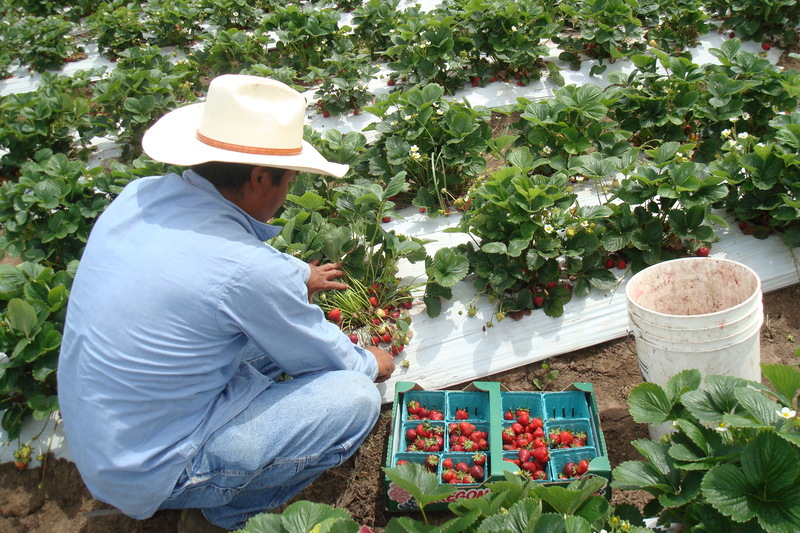 Speaking of berries, check out my recent radio piece on rare black cap raspberries, which a group of Latino farmers is reintroducing in the Northwest. I’m sorry I didn’t have a chance to make black raspberry ice cream before we ran out of town. Let’s hope there’s an even larger crop for us to bake and can with next year! Laura – The reason that you put the Saran wrap directly onto the surface of the curd is to keep air out and thereby prevent a skin from forming on the curd. Thanks for that info, Judy! Now I know. It’s cool how the curd solidifies and becomes so smooth. Forgot to say that I had changed the Bon Appetit lime curd recipe a little bit by adding the grated rinds of two limes to the egg mixture before heating. I think the rind gives a more robust lime flavor. I added the zest from the two lemons to my curd, as Ivy Manning directed. The only problem was I couldn’t find organic lemons at the Hannaford’s in Maine, and I find conventional citrus to be a bit waxy. I try to only buy organic citrus for zesting. I can confirm the strawberry shortcake was wonderful- best ever! !